Quilt barn trails are becoming more popular throughout the United States every year. Pennsylvania Dutch hex symbols are often painted on barns -- barn quilt projects are a wonderful extension of that practice. Yancey County, North Carolina, is just one of the many quilt barn trail communities in the US. 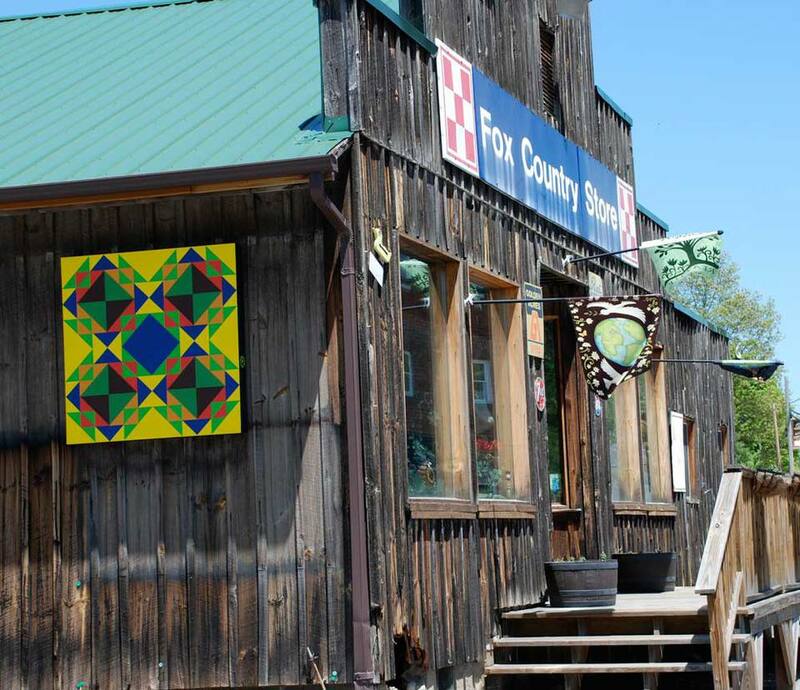 Travel to the area to see colorful quilt blocks displayed on all sorts of buildings, from barns and businesses to public buildings and personal residences. All of the barn quilt pictures in this gallery were taken in Burnsville, the Yancey county seat. Corn and Beans is the quilt block displayed on the side of the Fox Country Store on Cherry Street in Burnsville. The Purina red-and-white nine-patch logo on the front of the building gives this business a double-duty quilt display. Witch's Star is a quilt block that's displayed on a barn just off of Green Mountain Road in Yancey County. This North Carolina Star quilt block is on display at the Toe River Arts Council on West Main Street in Burnsville. Don't miss the wonderful Wizard of Oz mural just down the street. Watch for the Girl's Favorite quilt block at I Thought About You on West Main Street in Burnsville. If you like Girl's Favorite, you'll probably love the more intricate Girl's Choice quilt block pattern. The Double Duty quilt block is located on the back wall of the Grapevine, the same building that displays the ​Coca-Cola mural on the next page. You'll find this colorful Coca-Cola mural on the side of a building in downtown Burnsville. The building's quilt block is on its back wall. You'll see this Rose quilt block on the front of the current Yancey County Library, located on the Square in Burnsville. A McIntosh Star quilt block is displayed on a barn as you enter Burnsville from the west (on Highway 19). Courthouse Steps has the perfect location -- the quilt block is displayed on the front of the Yancey County Courthouse. Here's another quilt block that's perfect for its location. Circular Saw is on the front of the Heritage Lumber building on the Highway 19 Bypass in Yancey County. Where do you think Homemaker's Dream can be found? If you said "a real estate office," you're absolutely correct. You'll find the quilt block displayed on Carolina Mountain Realty's building. This Broken Dishes quilt block is displayed on the New To You Furniture building at 601 East Main Street in Burnsville. The Bard of Avon quilt block is displayed on the Parkway Playhouse on Green Mountain Road in Burnsville. A variation of an old favorite, you'll find this Moon and Star Over the Mountain quilt block on the front of the Cultural Resource Center at 113 Green Mountain Road in Burnsville. Look for the Breadbasket Star quilt block at the Corner of Westover and West Main Street. This Amish Star quilt block is located on a building at 240 East Main Street. You'll find this quilt block, named '65 Vette, at Burnsville's Chevy dealer on West Main Street. Pineapple Friendship Star is a quilt block on display at the Burnsville Chamber of Commerce, 106 West Main Street. The Carriage House, on South Main Street in Burnsville, displays this Minnesota quilt block. To see the Moon and Star quilt block, travel to Dixie Styles Antiques on East Main Street in Burnsville. You'll find this landscape mural on a building in downtown, Burnsville. The murals around town are gorgeous ​and mesh wonderfully with the county's quilt barns project. Drive to 106 North Main Street to see the Empty Spools quilt block. Follow the quilt barn trail to the Colonial at 211 East Main Street to see this gorgeous Sawtooth Star quilt block. A church on Avery Street displays a Cross and Crown quilt block. Twinkletoes, with socks rotating to form an inner star, is a quilt block found on the Burnsville Hosiery building. Travel to Green Mountain Road to see the Traveler's Star quilt block -- you'll find two more quilt blocks at the same intersection. This Railroad Crossing barn quilt block is on the side of the Subway sandwich shop in Burnsville -- a fitting block for the shop's theme. Star of Nutrition is on the side of a health food store located on West Main Street in Burnsville, North Carolina.